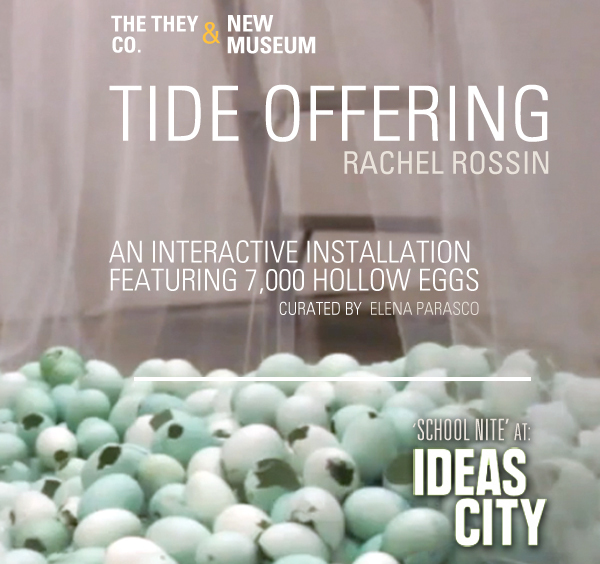 Rachel’s interactive performance and installation, Tide Offering, features 7,000 hollow eggs for viewers to walk on. Please join Rachel for her performance and installation this Saturday as a part of New Museum’s IDEAS CITY and ‘School Nite’ at 233 Mott St. This is a very special installation involving 7,000 eggs for viewers to walk on. Performances on May 4th and May 8th will take place on every hour from 7-10 throughout the night. Please find the influence and impetus for ‘Tide Offering’ in a beautiful piece written by Elena Parasco below. The New Museum Biennial: IDEAS CITY and SCHOOL NITE presents Tide Offering, a rite-saturated installation by performance and fine artist, Rachel Rossin. On view Saturday May 4 and May 8 – 12, Tide Offering extends a poetic and transcendental nod to religious rituals and ancient traditions of Tibetan Buddhism and Christianity. An experiential portrait of metaphysical cosmos, Rossin employes a beautiful and dedicated 50-hour process of hollowing 7,000 eggs that line the floor and sit on layers of river sediments. Referencing the transience of life, the egg which symbolizes fertility and rebirth, is recycled back into life through the cooking of the hollowed and the laying of the shells. Visitors are encouraged to crack their shells of speculative logic and shed into a new form as they step throughout the space. Like the Tibetan tradition of the Sand Mandala*, Tide Offering establishes a sacred space that utilizes the crushing of a material as the artistic utensil of ritual expression. Flipping the dogma-enriched modality of what constitutes typical religious tradition, Rossin harnesses a space where one can embrace the liminal and bare essence of self-understanding and exploration. The visitor can participate in the fresh deconstruction of the created and awaken through radial balance of inner-quest and outer-offering in a mind-expansive space. The transformative nature of rituals, ceremonial transcendence, and entrance and exit of the “awe” is explored, pushed, and embraced in Tide Offering. Though, the last stage of such creation, retreat, and deconstruction of the installation is intended to be met when the oddments of eggshells are released into a moving body of water. Taking the vial filled with broken shells in a “bardo” state and allowing the blessing to be circulated widely. Through layers, ritualistic deconstruction and sensuous and spiritual rebirth, Tide Offering is an inner room more than a physical one that welcomes patrons to come in as a visitor and leave as themselves. Click here to learn more about IDEAS CITY and School Nite! *Sand Mandala: a Tibetan Buddhist tradition involving the creation and destruction of mandalas made from colored sand made from crushed stone. It is destroyed once it is completed and its accompanying ceremonies and viewing are finished to symbolize the Buddhist doctrinal belief in the transitory nature of material life.